The canvas tends to be the most susceptible part of the camper for mold and mildew problems. It's important that if you have a major mold problem in your camper, you treat the entire interior including the upholstery, carpets and hard surfaces. However, the canvas undoubtedly takes the longest to clean and therefore, you'll want to start there first. The first step in ridding your camper of mold and mildew is drying it out. Ideally, you should unfold the camper and let it sit out in direct sunlight. Direct sunlight helps inhibit growth of mold spores. While drying it out won't deal with the stains that are already there, it will help prevent further spread and the sunlight will kill any live mold spores. Using a stiff bristled brush or a stiff broom, brush and scrub as much mold off of the canvas as you possibly can. If the problem isn't too sever, you may be able to get a substantial portion of the mold off of your canvas. In most cases, scrubbing with a stiff brush is just the preliminary, but necessary, first step to mold removal. You want to avoid using bleach and chemicals that contain bleach. While it's true that bleach effectively kills mold, it also strips the canvas on your popup camper of its sealant. Having a mold-free camper that leaks is no better than having a moldy camper! The general rule of thumb is to use the mildest cleaner you possibly can, that is still effective against your mold problem. For each homemade solution, mix the solution in a spray bottle according to the proportions below. Spray solution directly on mold, and use a damp cloth to wipe clean. Use a towel to wipe up any excess moisture and leave the camper opened in direct sunlight if possible. Always test solutions in an inconspicuous area. Rubbing Alcohol: Mix a solution of half rubbing alcohol and half water. The acidity in the rubbing alcohol kills mold spores. Vinegar: Vinegar has long been used as a cleaning agent because of its ability to kill mold and mildew spores. Use it straight on the mold spot to kill spores and clean stains. You can dilute it with water as well. Tea Tree Oil: Tea tree oil has anti-fungal properties and can work well to treat mold. It is more expensive than vinegar and rubbing alcohol, so it's ideal for treating smaller areas. Mix together two teaspoons of tea tree oil with two cups of water. If you catch mold right away, you should be able to treat it painlessly. However, if your mold problem is big, or you simply want a commercial product, there are products on the market designed for use on campers. You'll want to be careful and choose something that is made to remove mold and mildew, but will not damage the water protectant coating on your camper. Follow manufacturer's directions to apply. Before you put your camper away for the season, you'll want to take precautions to prevent any future problems. 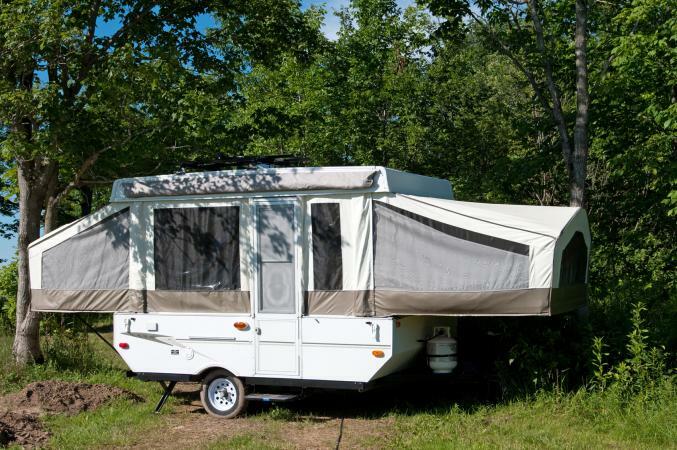 Not only does this include determining and dealing with the source of your mold, but it may include repairing the canvas of your camper, or giving your camper a preventative treatment to help restore the sealant on the canvas material. Make sure all the pipes in your camper are in good working order. If you find any leaks, go ahead and repair them before you put the camper away for the season. Keep in mind that not all repairs are easy DIY projects. You might need to hire a professional. For recommendations, it's best to go to your local RV or camper dealer. If your camper has a leak in its canvas, you'll want to repair it with a product specifically designed for popup camper canvas. It's important to use something that's specifically designed for campers so as not to further damage the camper. If repairing the leak is not an option, you'll have to look at replacing the canvas. For the best advice, call your camper's manufacturer. Even if your camper is no longer made by that manufacturer, they will be able to tell you how to fix the canvas on your camper. If your camper is no longer waterproof, take care to repair the damage early before it can get worse. Use a product specifically designed for camper canvas use such as Dry Guy Tent and Outdoor Gear waterproofing spray. Do not make the mistake of trying to waterproof your camper with a product not specifically made for campers. You've heard the saying, 'an ounce of prevention is worth a pound of cure.' The best way to prevent mold problems in your camper is to put it away dry and store it in a dry place. If it's raining when you put the camper away, unfold it and dry it out in the sun as soon as possible. Check pipes seasonally for leaks and make repairs as quickly as possible. Actively preventing mold and mildew in your camper is the best way to avoiding costly repairs or even canvas replacement.